Janie McCleary runs one of the first movie theatres in New Brunswick. A successful woman in a world of men, she is ostracized, a victim of double-dealing and overt violence. She trusts no one outside her family. 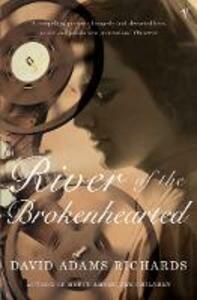 Spanning generations, River of the Brokenhearted explores the life of this formidable woman, a pioneer before the age of feminism, and her legacy as it unfolds tragically in the lives of her son and grandchildren. Written with aching compassion and masterful sophistication, River of the Brokenhearted muses on the tyranny of memory and history, and peers into the hearts of these extraordinary characters. By the author of Mercy Among the Children.